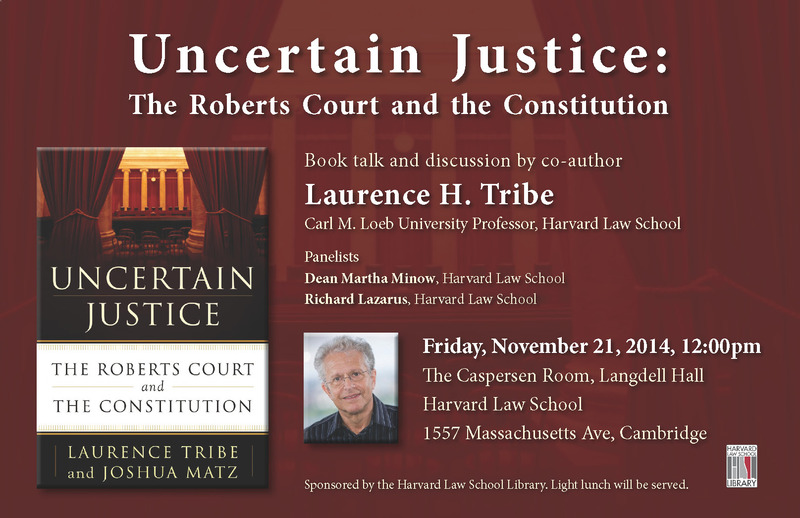 The Harvard Law School Library staff invites you to attend a book talk and panel discussion in celebration of Professor Laurence H. Tribe’s recently published book with Joshua Matz, Uncertain Justice: The Roberts Court and the Constitution. Friday November 21, 2014, 12:00 noon. Harvard Law School, Langdell Caspersen Room. (Directions). Sponsored by the Harvard Law School Library. From Citizens United to its momentous rulings regarding Obamacare and gay marriage, the Supreme Court under Chief Justice John Roberts has profoundly affected American life. Yet the court remains a mysterious institution, and the motivations of the nine men and women who serve for life are often obscure. Now, in Uncertain Justice, Laurence Tribe and Joshua Matz show the surprising extent to which the Roberts Court is revising the meaning of our Constitution. This essential book arrives at a make-or-break moment for the nation and the court. Political gridlock, cultural change, and technological progress mean that the court’s decisions on key topics—including free speech, privacy, voting rights, and presidential power—could be uniquely durable. Acutely aware of their opportunity, the justices are rewriting critical aspects of constitutional law and redrawing the ground rules of American government. Tribe—one of the country’s leading constitutional lawyers—and Matz dig deeply into the court’s recent rulings, stepping beyond tired debates over judicial “activism” to draw out hidden meanings and silent battles. The undercurrents they reveal suggest a strikingly different vision for the future of our country, one that is sure to be hotly debated. Filled with original insights and compelling human stories, Uncertain Justice illuminates the most colorful story of all—how the Supreme Court and the Constitution frame the way we live.” — Henry Holt and Co.